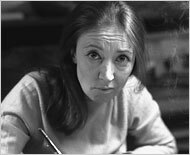 In memory of the most worldwide important italian journalist: Oriana Fallaci dies at 76 today in Florence. You can praise her, disagree with her, quote her, disbelieve her, glorify or vilify her. About the only thing you can’t do is ignore her. You are currently browsing the archives for the off-topic category.